Now with more! Originally posted on our blog by Lauren Griffith as “The Kinesiology and Biomechanics of the Freestyle Stroke” Parts 1 and 2. How many laps of the freestyle stroke do you think you’ve performed? Hundreds? Thousands? Millions? And which muscles do you use? Have you ever felt that comfortable ache in your muscles after a great swim and wondered what exactly is going on under your skin? Or have you ever felt a twinge and realized your stroke was a little off? Improve your stroke and prevent shoulder injury by better understanding the kinesiology and biomechanics of the freestyle stroke. The first stage of the freestyle stroke is the catch. During it, your hand hooks into the water to start the stroke. In the photo above, the hand submerged in water illustrates this phase. 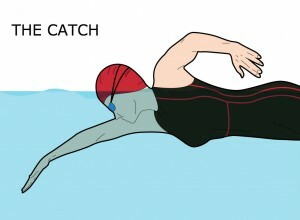 “The normal “catch” occurs when the forward hand enters the water as the upper trapezius elevates and the rhomboids retract the scapula [shoulder blade].” These two muscles should be bearing the brunt of your effort during the catch phase of the freestyle stroke. 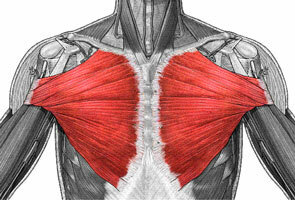 The trapezius is a large muscle on the surface of your back that is shaped like a triangle. There are several layers of back muscles – approximately three (superficial, medial and deep). 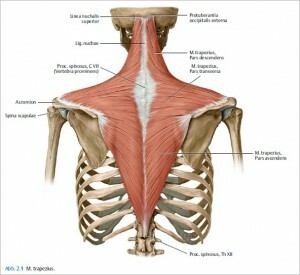 And the trapezius is one of the top layers of back muscle (superficial). It starts at the base of your neck, lays over your shoulder, shoulder blades and center of your mid back. It’s primary function is to stabilize and move the shoulder blade. However, it can also perform movement of the spine when the shoulder blades are stable. 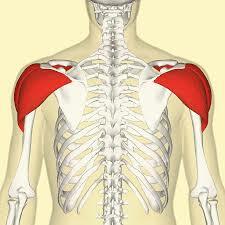 The rhomboids are a muscle group that lie deeper than the trapezius (medial), directly underneath, in fact. They are smaller in size and they are shaped more like a quadrilateral. They are located in between your shoulder blades and attach to your spine as well. The rhomboids are responsible for retracting your shoulder blades (pulling them in towards the center of your back). The early pull-through is the second step of the freestyle stroke. It is the phase where your arm begins to pull through the water. “The serratus anterior protracts, rotates the scapula up, and is highly active from this point in the catch and through the pull. These opposing actions hold the scapula in place.” Give your rhomboids a break and work this muscle to keep your shoulder blade in place. 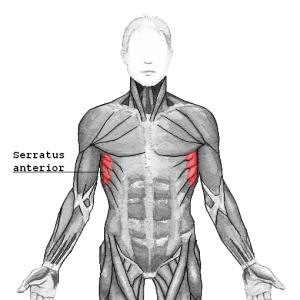 The serratus anterior is a muscle that attaches to the surface of the 1st rib to the 8th rib. 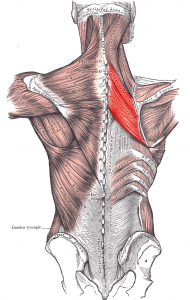 The other side of the serratus anterior tucks under the scapula, or shoulder blade, on the inside of your body. Visually, you would recognize it as a muscle that runs along the side of your chest under your armpit. Tip: Be careful not to drop your elbow or wrist! Keep your elbow high, and don’t over extend your reach. You do not want to feel like you’re pushing the water down with your palm. 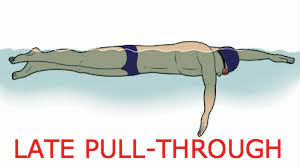 The late pull-through is the third step of the freestyle stroke. It is the phase where your arm pulls the water behind you, propelling you through the water. “Just after the catch, the pectoralis major fires and adducts and extends the humerus while internal rotation is balanced by the antagonistic external rotation of the teres minor.” These chest muscles pull your arm down along your body. The pectoralis major is a thick, top layer muscle that lays right on your chest. It is shaped somewhat like a large clam shell or a fan. 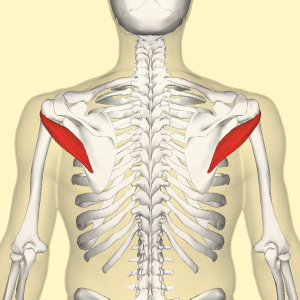 The pectoralis major has four main functions, all of which involve moving the shoulder joint. 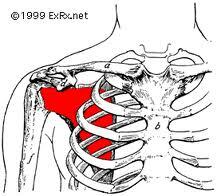 The teres minor is a small, narrow, muscle that is deep to the pectoralis major. It is shaped like a long and skinny rectangle. The teres minor is considered a rotator cuff muscle. It helps keep the arm attached to the shoulder blade since it is a ball in socket joint. Its main job is to aid in rotating and lifting the arm outward away from the body and across the body. It also assists in any other arm movements that occur at the shoulder as an assisting muscle. Tip: Use those chest muscles to pull the water behind you. Your palm should spend most of the pull phase “looking behind you,” perpendicular to the direction you’re swimming. 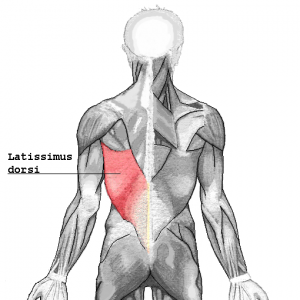 The latissimus dorsi is a large, flat, broad muscle. It is mostly a top layer muscle (the trapezius overlaps it just a little bit). The latissimus dorsi helps you extend your arm out and back in, flex your arm from an extended position, and rotate your arm in towards your body at the shoulder joint. It also helps you flex and extend your lower back and it can influence downward rotation in the shoulder blade. The subscapularis is a small, triangular shaped muscle that lies on the back side of the shoulder blade (inside the body). One part of this muscle’s role is to protect and stabilize the arm (preventing displacement). But the main job of the subscapularis is to rotate the arm inward toward the body. Also, when the arm is raised above the head, the subscapularis helps pull the arm down in front of the body. It’s easy to remember if you think of the other common meaning of abduction, which is to be drawn away from planet earth by aliens. Both meanings refer to being drawn away. 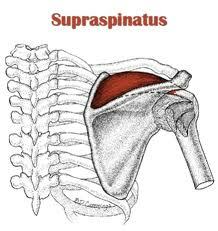 The supraspinatus is a smaller, skinny, muscle that is shaped like a triangle and sits on the top of your shoulder. The primary role of the supraspinatus is lifting the arm up and out from the side of your body (another form of abduction). Basically it’s role is very similar to the deltoid with one exception. Deltoids help move the arm up towards the front and the supraspinatus helps move it up and to the side. 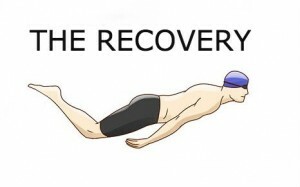 Tip: The recovery step of the freestyle stroke is called that for a reason. Let those muscles responsible for your forward movement rest, and use these last four muscles on our list. Let them do the work of getting your arm in position for the next stroke with as little effort as possible. Save your energy for getting good form on the catch and lots of power on the pull, and you’ll end up with a more efficient stroke. When you think about the actual muscle in use while you use it, you can actually build that muscle and learn to use it better. Now that you know the muscles used in a proper freestyle stroke, focusing your attention on those muscles during the appropriate stages of the stroke can help improve your form. By building the right muscles up, you’ll avoid the strain, pain, and injury that come with overusing the wrong ones.